Cultural tour at Ubirr in Kakadu National Park. NT. Wilderness, culture, plains and waterways teeming with wildlife; get your camera ready for unforgettable sights. To describe the 550-kilometre Nature’s Way drive from Darwin to Katherine as the ‘scenic route’ is a wild understatement – and this is not a region given to understatement, though the ‘wild’ part is true enough. Some of Australia’s most iconic wilderness is closer than you think, with Kakadu National Park only a three-hour drive from Darwin. Turn the drive into a seven-day masterpiece and you’ll see not only Kakadu and Katherine but the rainforests and waterfalls of Litchfield National Park. Lingering longer gives this incredible part of the world room to breathe. When you consider that Kakadu translates to 20,000 square kilometres of unbelievable natural diversity – almost half the size of Switzerland – then taking a few days to more deeply absorb its expansive wetlands and wildlife populations, soaring sandstone escarpments and deeply held cultural traditions makes a lot of sense. Taking a cultural cruise up the East Alligator River, you’ll see the surrounding wilderness at its most pristine. Not only is there the chance to safely view crocodiles at leisure, and the complex network of birdlife, but you also have the opportunity to witness a display of traditional indigenous hunting and gathering implements. The atmospheric Warradjan Aboriginal Cultural Centre is a must-visit to get to know the inexorable rhythms of Kakadu, as lived every day by the aboriginal people. There are not four but six seasons here, governed by the ebb and flow of nature. Your kids will never look at seasons the same way again. 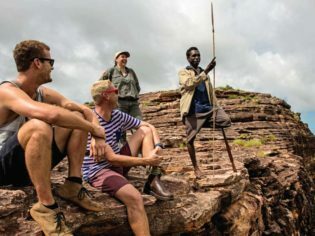 The hands-on nature of many Kakadu cultural and natural tours is perfect for families, guided by rangers and/or traditional owners who bring with them intimate knowledge of this World Heritage-listed area. You can also be guided through painting and weaving in traditional ways, while the highly acclaimed, free walking tour through the famous rock art galleries of Nourlangie, guided by a ranger, is part art tour, part history book, and entirely amazing in its epic scope and the timelessness of the land. 1. Be amazed at the diverse food-centric markets, such as the Mindil Markets, which are situated right on the beach, offering many of the best dishes you’ll ever taste. 2. Spend a few days in Nitmiluk National Park, home to some of the best adventure activities to be enjoyed in the Territory – canoeing, bushwalking, gorge cruises, swimming and camping out under the stars. 3. Have a fun and educational cultural experience with Top Didj, in Katherine, where you can make your own indigenous artwork, start a fire with sticks and perhaps try your hand at throwing a spear. to remind you of your NT holiday. 5. Plunge into crystal-clear waterholes and be invigorated under cascading waterfalls at Litchfield National Park, just 90 minutes’ drive from Darwin. Top Didj is simply the best! An excellent experience! Don’t miss it!